Review: Horror is a particular thing from country to country. US films tend to be more slick and catered to demographics, Japanese horror has never met a paranormal entity it can’t exploit, Italian entries focus on elaborate art direction, and Spanish horror favors atmosphere above all else. My experience with Australian horror films like Wolf Creek, Road Games, and Rogue are that they like to get down and dirty and show little remorse to either side of the terror. The victims Down Under get put through the ringer which usually means that the main villain will not only get what’s coming to them…but it won’t be pretty. A perfect example is The Loved Ones. Filmed in 2009 but just being released in the US, this is a twisted tale of obsession that is equal parts Carrie and Fatal Attraction. With a game cast and unyielding direction from a clearly talented newcomer, it’s a brutal film that doesn’t skimp on the squirm factor. If only it had a stronger script…it could have been a lasting example of pain done right. When Emily Blunt look-alike Leavy’s Lola asks handsome but troubled Brent (Samuel who was also the male lead in a previous 31 Days to Scare entry, Bait 3D) to the end of the year dance, she’s hoping that his good nature will prevail and he’ll say yes. Too bad he already has a semi-girlfriend (Thaine) that is as understanding as she is adequately beautiful. Soon Lola has her doting Daddy (Brumpton – chilling) kidnap Brent for their own special evening. What transpires over the course of the night is the main crux of the film so I shan’t give it away – let’s just say that Lola’s idea of a dream date is the stuff that nightmares are made of. As the film progresses we learn that this is not merely a tale of obsession between a lonely girl and the studly popular boy but a devious twist on that conventional set-up. Unfortunately, this central story just isn’t enough for director Byrne to focus on. There’s a whole other plotline of another couple going to the dance that seems ponderous and distracted – not aided by the two actors that can’t keep things interesting. Eventually, their parallel plotline fits into the mix but it’s too little too late. Samuel again cuts a nice swath as the leading man…though this role is pretty much the exact same one he played in Bait 3D. Both films have a prologue with Samuel playing a role in the demise of a loved one…and both films pick up several months later when he still can’t forgive himself. At the same time, credit should be given for the young actor to ably convey the emotion that goes alone with some of the hell he endures at the hands of Levy and Brumpton. Levy is pretty solid too…taking her nutso role serious enough to not push her over the edge too soon. A short sprint at less than 90 minutes, The Loved Ones could be a film that becomes a late night favorite…or certainly one that people will be interested to discover on the shelves of the video store and in their Netflix queue. I picked it up from Redbox and it’s more than worth the $1.20 fee you’d spend. It’s rare that horror films are so nice and nasty at the same time but The Loved Ones earns a recommendation on that balancing act alone. Review: It’s no secret to family, friends, or random strangers that my favorite movie is JAWS. There’s something about that film that has always spoken to me, my fascination with the ocean, and my love of sharks. It helps that it’s a damn fine film with assured direction, brilliant performances, that killer score, and one menacing shark. All in all…perfection in my book. Ever since JAWS was released I’ve always been a sucker for any movie with an underwater shark (or creature) chowing down on any kind of stock character the movie could throw at us. I’ve watched the television movies, read the knock-off books, been loyal to Shark Week through all the iterations of Air Jaws, and even shelled out my sheckles for Shark Night 3D which stunk worse than a chum bucket left out in the heat. So you can understand why I approached Bait with some trepidation. Though I was pleasantly impressed with the restrained shark thriller The Reef, it was clear that Bait was going to be more of the cheap scare variety so I could only hope that it at least did its business with panache. The resulting film is a good news/bad news sorta situation. The good news is that some of the shark effects look quite good. The bad news is that for every good shark CGI effect there are five more that look like a bad Sega game from 1989. In a perfect world, the sharks would still be built for practical use to avoid the cartoon-y look they almost always have in cinema. To be fair, even films with bigger budgets like Deep Blue Sea had trouble making their sharks look convincing…though to its credit Deep Blue Sea used a lot of robot sharks that looked real. More good news is that Bait places its sharks and their prey in an unusual setting which always keeps things interesting when you are dealing with weak effects and weaker acting. Though the supermarket that is flooded by a tsunami and brings with it two hungry sharks is well set-up, it can’t escape looking like it was built in a large tank of water. Clearly, the set was at the mercy of the elements that had to support large amounts of water and debris. The better setting is an underground parking garage that sets the scene for some of the better scares and had me getting my feet up onto the couch and off the floor more than once. While two lovebirds are stranded underwater in their car, another is trying to get to safety…and all three have to contend with a shark that knows they’re there and is figuring out how to get to them. Director Rendall does his best work here by finding some clever means of escape for the teens. In movies like this, if you’re going to insist on having several parallel storylines you must MUST make a case for it. In Bait, there are about five subplots going on that just never catch on. There’s a muddled twist about a store robbery gone awry, a love triangle, a father-daughter conflict…it’s just all too much to be supported on such flimsy, floating ground. It doesn’t help that the acting is subpar to say the least. While our leading man (Samuel) fares best with his haunted past angle, better known actor McMahon (Nip/Tuck) is totally out to sea with a half-baked character that he adds no life to. The women, usually the surefire dodos in horror films, are actually given their due here with help from Tonkin and Vinson who don’t just scream and yell and wait to get eaten. It’s interesting to note that Bait was released in its native Australia in 3D. It had a small run in the US utilizing the same technology and while I saw the 2D version I couldn’t see many places were the 3D would have added much in the way of depth or scares. In the long line of shark films Bait may have some teeth to it but it still can’t hold a candle to its bigger budgeted sister films that inspired it. I wouldn’t put it in the same universe as JAWS but it’s better than the usual direct-to-video crap that drifts out of tinsel town every few years. 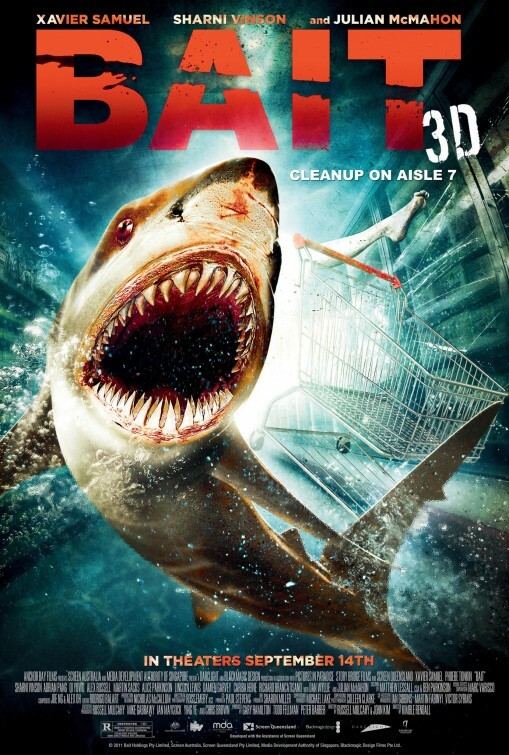 Synopsis: A freak tsunami traps shoppers at a coastal Australian supermarket inside the building … along with a pack of tiger sharks. Thoughts: OK…just go with me. Yes, its yet another shark tale. Yes, it’s in 3D and yes the shark looks kinda fake. Still, the premise of a tsunami hitting a coastal Australian town and bringing a hungry great white shark into new territory sounds campy and fun. I fear that the trailer gives too much away with showing several shark attack snacks but anyone that knows me will recognize why this Jaws lover will happily line up for this one.